I joked about wanting a Segway for my birthday last month, but got the gift I really wanted instead: Samantha Brown luggage. My family really spoiled me this time. I love it. Really love it. Take a peek inside. A fun travel pattern and LOTS of zippered pockets and pouches. I’ve long been a Samantha Brown fan. The perky travel host often travels the way I like to; looking for off-the-beaten path experiences as well as the popular tourist spots. When she went on hiatus, I was bummed. The Travel Channel could have asked me to backfill her during her maternity and family leave, but instead, they left her fans hanging. Then one day, as I scrolled through TV listings, I saw her name. I paid no attention to anything other than that and quickly switched to that channel. It was for HSN (Home Shopping Network) and was an hour-long sales pitch of her croco-embossed luggage line. I would have turned the channel, but there she was – Samantha Brown. It had been so long since I’d seen her. Not surprisingly (I am definitely the demographic they were targeting), within a few minutes, I decided I needed her luggage. And now, I have it! One of Samantha’s selling points as she wheeled her colorful luggage around was how powerful a nice set of luggage could be. According to her and others I’ve heard, dressing nicely and having nice luggage can often result in upgrades at hotels and on airlines. As Samantha put it, they see you and your luggage and think that you’re a traveler they’d like to cultivate, because you look like the frequent traveler that they want as a regular consumer. Makes sense, I guess. 1. How about someone standing in line for me through customs and immigration? That would be a nice benefit. 2. Or someone finding me a taxi that actually will take the credit card I’ve asked about before I get into the cab, but then have refused once I get to my destination? 3. I’m an introvert, so once I get to my room, I really don’t want to interact with anyone again. I need downtime. I’d love it if on the rare occasions I order room service (only on business, of course — who else can afford that?! ), the waitstaff could slip it into a slot in the door, like you see in prison movies. It always feels so intrusive to me to have them come into the room and arrange things. 5. How about an upgrade on the plane away from co-passengers with body odor and roaming elbows? 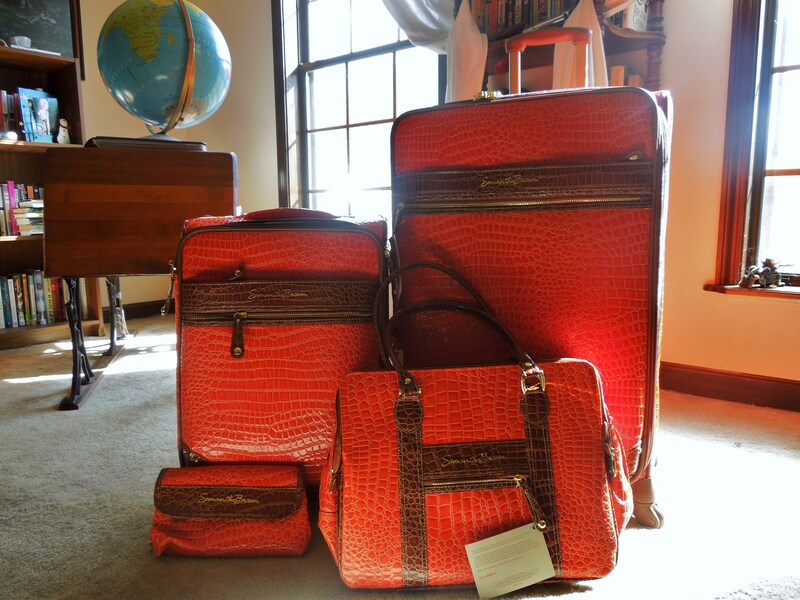 I don’t know if my new Samantha Brown luggage will change the way I travel or not, but I do love it. Let’s just say, I’m already enjoying an upgrade. If your luggage could get you upgrades, what kind of perks would you want? Thank you! I hope you get the luggage you like. I didn’t feel justified in buying this for myself, but I’m so glad my family did! Love your luggage Juliann, and now I want a set exactly that shade! Interesting. Have you thought of using a travel agent? They make their commission from the travel they book and your itinerary would be all planned out. I have gotten large suitcases at the thrift store, too. It’s a great place to find what you need for a great bargain price. I do love the luggage and hope you’ll enjoy using it on your upcoming trips. I think I’d want perks 1 and 2, but I can’t think of any others. Although what I really would like – going back more to luggage – is one of those tardis-like bags that is bigger (but no heavier) on the inside than it is on the outside. I would pay a lot for luggage like that. Surely someone will design this. Sounds like something everyone could use! Love Samantha Brown, too! She’s the best. A terrace! Wouldn’t that be a hoot? Plenty of fresh air, too. 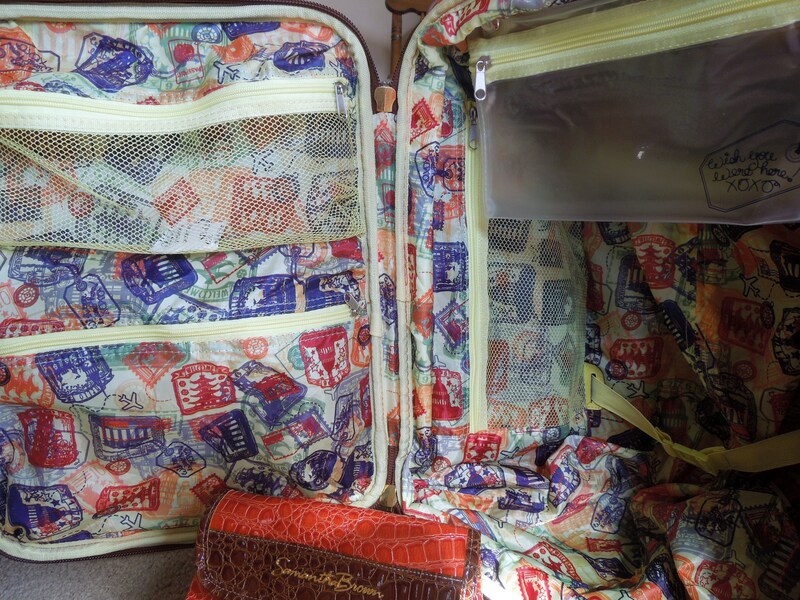 What great luggage – the inside lining is so cute! I love the idea of having room service delivered prison-style, great idea. How about a drive through customs booth so the taxi could take you straight to the plane? Not sure how the security issues would work but wouldn’t that be easier!